School signs can do a lot more for your school than you think. Not only do they bridge communication gaps, encourage involvement, and promote safety, they also have a huge impact on your branding. 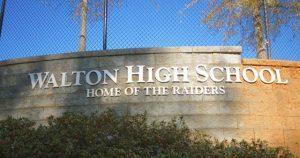 School signs can give passersby and visitors a good impression of your institution and can help achieve the image you desire. With all these functions that school signs fulfill for an institution as important as education, it’s vital that you get the signs with the highest quality. ImageTEK Signs & Graphics can help you out with that. 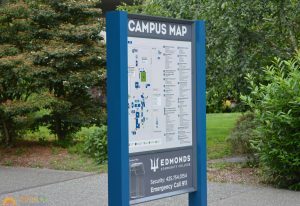 As a local sign company that specializes in designing, producing, installing, and maintaining school and university signs, we can provide you with tastefully designed, sturdily built, and strategically installed indoor signs, outdoor signs, wayfinders, flags, banners, and changeable reader board signs. 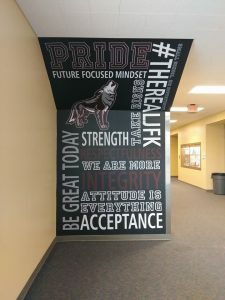 ImageTEK Signs & Graphics has successfully handled educational sign projects for numerous learning institutions and have helped them deliver an excellent brand experience to their visitors and customers, all this on time and within budget. We’re excited to deliver the same for you! Call ImageTEK Signs & Graphics today at (201) 351-8755 for a Free Consultation! Your school’s signage needs vary depending on many factors: budget, purpose, goal, brand, etc. The good news though is that ImageTEK Signs & Graphics is a full-service sign company that has a wide selection of sign designs, types, materials, and production methods so you have all the options that you need when choosing the signs that suit your school’s needs. Some indoor signs can be subject to up-close scrutiny, and we’re committed to delivering only the high-quality interior signage. From digitally printed banners, to portable vinyl standees, to aluminum lobby signs, to illuminated information boards, and even to LCD displays, ImageTEK Signs & Graphics has the perfect indoor sign for you. Vinyl banners are perfect for signs that serve a temporary or short-term purpose such as school events and congratulatory announcements. If you’re looking for signs that you want last for years, aluminum, wood, steel, LCD, LED are excellent options. 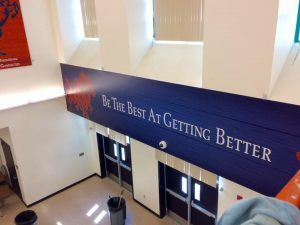 By partnering with an established signage company such as ImageTEK Signs & Graphics, you can be sure to get the indoor sign to not only complement your school’s interior, but to also effectively convey important messages to your audience. Depending on your school’s location, you may be required to have your outdoor school signage conform to certain standards in order to ensure maximum effectivity in promoting safety. Guidelines can include specific standards with regard to your school signs’ size, color, substrate, text, shape, and placement. ImageTEK Signs & Graphics knows how important these guidelines are and we take them very seriously. Every step of our process, from conceptualization to installation, is designed to ensure compliance with the set standards. If, for example, your exterior sign is required to be reflective or illuminated, then we have the technology and the knowledge to deliver that to you. 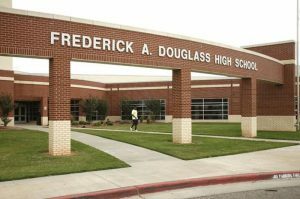 ImageTEK Signs & Graphics also partners with the most reliable suppliers for materials and substrates to ensure that we are able to provide the types of exterior signs that your school needs. Whether your establishment needs monument signs, pole signs, fascia signs, marquee signs, or changeable letter signs, we can provide you ones that serve their exact purpose and are also tough enough to stand against the everyday outdoor elements. If there are three things that schools are full of, it’s students, rooms, and rules. All educational institutions have students who need guidance, rooms that serve various purposes, and rules that need dissemination…and effective wayfinders can help you with all these. Wayfinding signs come in different forms. They can be directional, identification, informational, and regulatory. ImageTEK Signs & Graphics can provide you with all of these options and can even help you decide which ones would be ideal for your goal. By installing wayfinders in your school, you can help give students a convenient and easy way to navigate the area. You can label and identify the different areas so that your audience knows where they should and should not be. Wayfinding signs also help you inform your audience about the rules and restrictions in your school. For people who are always rushing from one place to the next, high-quality wayfinding signage are an effective way to quickly tell them what can and cannot be done in the school premises…these include parking policies, speed limits, and smoking policies. ImageTEK Signs & Graphics has the technical know-how, tools, experience, and network of suppliers to provide you with the best signs for your school. And we don’t just provide generic, store-bought-quality signage. ImageTEK Signs & Graphics’s process includes analyzing your request, studying your school’s needs, and working closely with you to ensure that you receive custom-crafted signs that deliver maximum impact. Our team is composed of skilled project managers, graphic artists, marketing experts, and signage specialists who can meet your needs from the design phase all the way to installation and repairs. ImageTEK Signs & Graphics understands just how important your school’s role is in society, and we want to be a part of that. We not only want to deliver great signs, we also want to make sure that you order the educational signs that are most suitable for the purposes you have in mind. Just as you are passionate in sharing education and learning, ImageTEK Signs & Graphics is also passionate about sharing our knowledge and expertise about signs with our clients. If you want to know more about effective school signs and just how we can help you out with that, call us and we can have one of our senior staff answer your questions. Call ImageTEK Signs & Graphics today at (201) 351-8755 for a Free Consultation with a School Signs Specialist!